Lee Nogan was capped at full international level at Wales. He made important appearances at Wembley, for Reading and Grimsby. 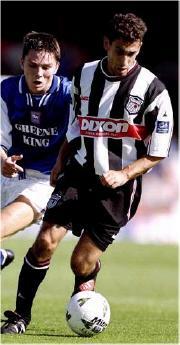 Despite these career highlights, most Town fans remember him as a decent player in Division II, and a below-average one in Division I.
Nogan arrived at Blundell Park as a cut-price replacement for "Super" Clive Mendonca, and formed a fine partnership with Jack Lester as the Mariners put together a quality passing side, that was usually just too good for their Division II opponents. Perhaps Nogan was a victim of his own success. Expectations were raised by Town's promotion, but the first division defences were far harder to break down. Lester often managed this through close control and an aggressive style, constantly forcing errors from his markers. In truth, Nogan lacked the pace and physical presence to manage this. As his confidence fell, his shooting accuracy left him too - example: a miss at home to Crewe when it looked easier to score. The lack of depth in the Mariners' squad saw Nogan play the majority of games in our first season back in Division I, when a rest may have done him good. Ultimately, the Grimsby crowd got on his back for his lack of goals, and he infamously made some on-the-pitch comments and gestures towards fans in the home tie against Tranmere, only to be substituted by Buckley after only half-an-hour as a result. Towards the end of his career with Grimsby that Alan Buckley made it clear that Nogan was no longer required at Blundell Park. So off he went to Darlington, amongst the richest of Division Three clubs, only to find that his dream partnership with veteran Marco Gabbiadini was to be disrupted by a variety of loan signings (including ex-Sunderland striker Craig Russell) and youngsters. Departing from Feethams, Nogan returned to his former club Luton Town at the start of this season, an experienced head amongst a young group of players. 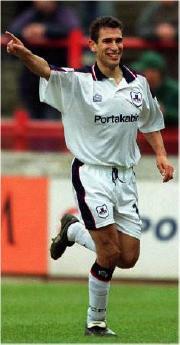 Despite his problems at Darlington, by moving back to Kenilworth Road, he moved back to Division II. However, Luton have not performed well in the post-Lennie Lawrence era, and Lee recently joined 3rd Division strugglers York City until the end of the season. He will be a crucial factor in whether or not they survive the dreaded drop out of the football league. But Nogan should beware - the last ex-Mariners striker to end up at York was Neil Woods, who shortly afterwards found his career ending as a squad player at non-league Southport.